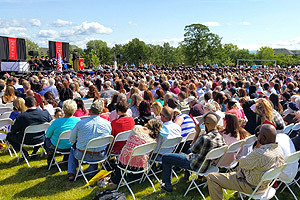 REDDING, Calif. - Simpson University honored 224 graduates during a spring commencement that featured the president of the Council for Christian Colleges and Universities as keynote speaker. Dr. Shirley Hoogstra started in September 2014 as head of the Washington, D.C.-based CCCU, which has more than 180 member institutions worldwide. She shared experiences from the past seven months of learning to risk more, trust more, and worry less, noting that being out of her comfort zone and not in control brought her closer to Jesus, and that change builds trust. “You will never be disappointed relying on Jesus,” she said. “Being in a place of vulnerability was scary and, I want to tell you, exhilarating,” she said. The class of 2015 included 156 traditional undergraduates—the largest graduating class since at least 2006—as well as graduates from the School of Adult Studies (ASPIRE degree-completion), School of Education, and A.W. Tozer Theological Seminary. Watch the commencement ceremony online here. Amy Haley, 22, of Cottonwood, Calif., and Elena Kurian, 21, of Jefferson, Ore., made history as Simpson University’s first Spanish double majors. A Spanish Language and Culture degree is the newest traditional undergraduate program, designed to enhance job prospects for students wishing to add it as a second major. Haley, who also majored in English, is looking into graduate school and interested in teaching English as a Second Language overseas. Kurian, whose second major was psychology, would like to pursue a graduate degree in public health or nutrition. Both Haley and Kurian were interviewed by a Record Searchlight newspaper reporter on graduation day for an article and video. Mathew Wachtor, 29, moved to Redding from Korea to complete his M.A. in Education and teaching credential through Simpson University’s School of Education. Wachtor, who was finishing his student teaching the week of commencement, lived in Korea for seven years, where he pursued a graduate degree in Korean studies and began working at an international school there. “There I rediscovered my passion for learning and teaching and decided to pursue my teaching credential,” he said. Shortly after that, he learned about the teacher credentialing program Simpson’s School of Education offered in Korea and began his studies there. The Korea program has since closed, but Wachtor wanted to complete his studies with Simpson and made the decision to move to Redding, where he finished both his master’s degree and California teaching credential. He plans to return to Korea to work at an international school as an English teacher and the curriculum director. For liberal studies graduate Tabea Frank, commencement was also an occasion to see people she doesn’t get to see often: her parents, Helmut and Judith, who are missionaries in Turkey; and her brother, Simeon, who graduated from Simpson in 2012 and now works for a software company in London. Tabea, who plans to pursue her teaching credential at the School of Education and would like to teach young children, lived her first year in the residence halls on campus before moving to Gatehouse, a nearby home for college-age missionaries kids. Simeon majored in business and Bible and theology while at Simpson. He enjoyed reconnecting with some of his professors while back on campus. After serving in ministry for over 25 years, Gregory Morales decided it was time to change career paths and go in to counseling. Morales, a 45 year-old Willows, Calif., resident, enrolled in Simpson University’s School of Adult Studies’ online psychology degree-completion program. 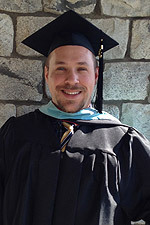 He stayed connected with professors and classmates by using Skype and Moodle, Simpson's online learning management system. “What I found rewarding is even though it is an online platform, I was able to still connect to the others in my cohort and in the process learn a lot of great stuff,” he said. 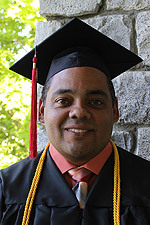 Morales plans to find a job in a psychology-related field using the new skills he has learned. He also hopes to attend graduate school and go into a career in counseling and/or therapy. Spring commencement also included Simpson University’s third class of four-year bachelor of science in nursing graduates. The 35 students were the first nursing graduates to have used the new Science and Nursing Center, which opened in fall 2014. Simpson University was founded in Seattle, Wash., 1921. During its 25 years in Redding, the Christian university has grown from 200 to more than 1,200 students. In addition to offering 24 four-year bachelor’s degrees in its traditional program, Simpson has also helped nearly 3,500 North State residents complete their degrees through the School of Adult Studies (ASPIRE) program, which offers classes online and on campus. 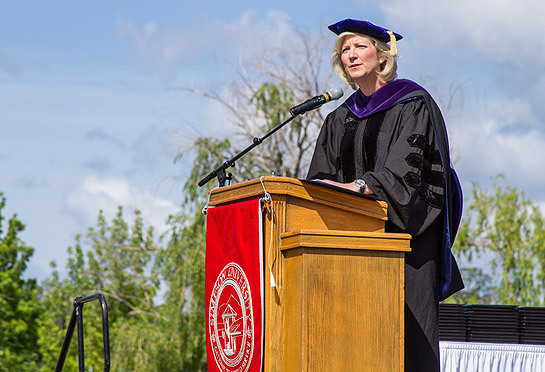 Photo, top, by Matt Murnan / Dr. Shirley Hoogstra, president of the Council for Christian Colleges and Universities, addresses graduates during Simpson University’s April 25, 2015, commencement.